In addition, the Azurlingua language school teachers can be contacted on-line at www.bonjourdefrance.com for French practice and on-line discussion. 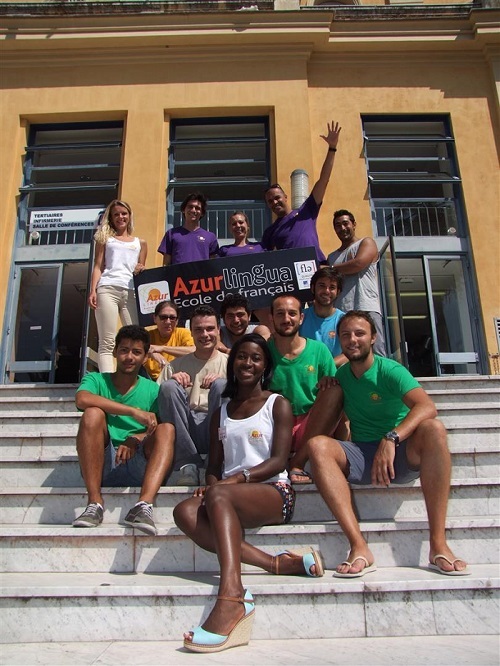 The teaching at the Azurlingua school centres on a knowledge of the language and of the culture, whilst developing the communication skills of each student. It focuses on oral expression and comprehension based on original documents, role-playing games, simulations and creative exercises, not forgetting modern communication tools such as multimedia network material available online in the classroom. Written and oral test set the first day. Certificate of attendance indicating the number of classes taken supplied at end of course. Available all year round, these short or long courses are aimed at all those wishing to learn the vocabulary, grammar and structure of the language whilst developing their communication skills. 2 weeks minimum - 20 lessons per week, max. 10 students per class. 2 weeks minimum - 30 lessons per week, max. 10 students per class. 12, 13, 24 or 36 weeks - 20 lessons per week, max. 12 students per class. In addition to their courses, students may take part in specialised workshops preparation for 1st and 2nd level DELF, French for business and French for tourism and the hotel and catering trade. "I have experienced many language schools in the word but I have to say that learning French with Azurlingua is like flying with first class. It is a serious school which offers high-quality education with whole-heart."